We'd recommend that you get to grips with your Twitter account before jumping into your first Twitter chat. Ask yourself a few questions, is your Twitter profile up to date, have you created brand awareness by including your company logo, have you linked to your website? A Twitter chat is a group of people coming together on Twitter for about an hour each week to have a conversation that revolves around a pre-determined hashtag. As long as people include the hashtag in their tweet, they’re part of the conversation. It’s a great way to meet lots of like-minded people, as well as receive and give advice. Moving on how do you find a Twitter chat? Since directories aren’t always reliable or up to date, start by looking for chats on Twitter (you can identify them by the repetitive hashtag). You can also find out about specific chats in Twitter bios, hosts will often mention them there. 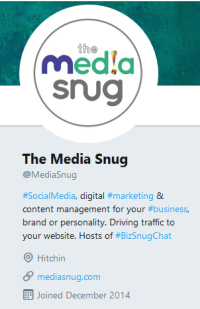 Take a look at the @MediaSnug bio. We host #BizSnugChat every Tuesday between 11-12 noon GMT (or BST in Summer). Get prepared, it’s going to be fast! You may want to tweet in advance that you intend to join the Twitter chat using the hashtag to connect with the host. We'd recommend that you use your browser or third party client like Hootsuite, TweetDeck or even tweetchat to join in with the Twitter chat hour, a browser-based experience is much better than that on iOS and Android. Don't forget to use the hashtag in every post, if you don’t do this nobody will see your tweets in the conversation, and you’ll quickly become frustrated. You’ll often see questions in the format of Q1, Q2 etc, it’s always best to answer A1, A2 in response. There are essentially two separate tabs, that you can open in your browser, to take your twitter chat enjoyment to the max. Go to google, search for "twitter" then log in to your account. Go to your Twitter profile and click on the notifications bell - top left. Leave this tab open in your browser so that you can come back to see your twitter notifications (who's mentioned you, who's followed you) easily. Open another tab in your browser, once again logging into twitter. In this tab use the search box to look up the required hashtag. You'll be shown the results, with the auto setting on the top left saying 'top'. Hit the latest menu option next to that and keep this window open. If you refresh every now and then you'll see the latest tweets from the conversation in front of you. Once the hour has started, you may not be sure what to say. Simply come on and introduce yourself at the beginning. The point of Twitter chats is to be social. Speak up. Find ways of chiming in on things, even if it’s just to say you agree. It’s hard for a guest to answer everybody’s questions because most chats move fast and it’s easy to miss things. Don't be tempted to pre-schedule spam tweets. It's very obvious and your tweets will simply be ignored. Say thanks! Remind yourself to join in next week. The reach on Twitter chat hours is often very good, so it’s well worth taking part.